It was even a bit more special because Soph & Dominic got to watch the fireworks with their Australian friends who live in the area. We don’t see them all that often but the kids are connected via technology and always have fun when they’re together. God has blessed us with their friendship. Both Dominic and his Aussie friend Benedict (giving the thumbs up), both wrote the “brevet” (a national, standardized, 2-day test for 9th graders) last month. Both of them are former homeschoolers and both did better than many of their classmates – Shout out to homeschool! Dominic passed the exam which contributed to him passing the year at an overall 67%. To think that he only began French-language schooling back in September. We’re very proud of this accomplishment and thankful for the Lord’s help. Remember what this passage says? Any day is a good day to pray for those in authority… but perhaps especially on the national holiday. Well… the dynamic duo has thrived during their first week away. They spent some great family time on various outings and Timo did lots of cooking with nonna. Late last night they hopped on a plane for the second leg of their journey: Dublin, Ireland. Liz’s good friends Randy & Carolyn Fudge work there with inner-city youth (although originally from Indiana). Liz spent a year with them as a high school exchange student and Carolyn was matron of honour at our wedding. What was Timo most excited about seeing / doing in Ireland? We’ll see if we can get any photos of this austere moment! Shout out to Tim Horton’s fans! I’m keeping things short on the blog this week because the bulk of my energy is going into completing final edits for the new book this weekend so that I can get it on Amazon and have copies with me at NAYC. 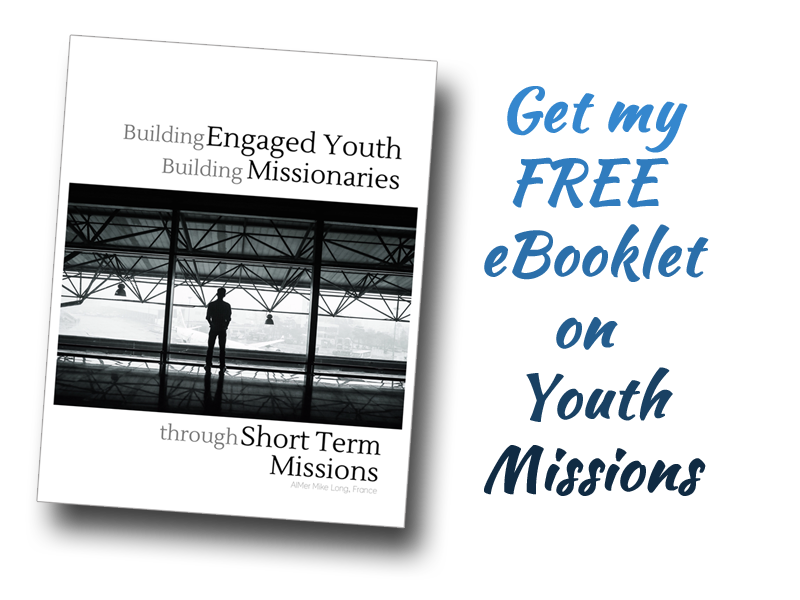 My prayer for this book is that it help scads of young people have as positive an experience as I’ve had with short-term missions over the past 30 years or so. More on that in the coming weeks. We’d appreciate you keeping us in your prayers in the lead up to our Associate Missionary status interview on Wednesday. There are four levels of appoint within Global Missions: (1) A.I.M. (our current status), (2) Associate Missionary, (3) Intermediate Missionary and (4) Appointed Missionary. The change in status wouldn’t change a great deal in our day-to-day, but if you think of it in terms of job-progression, it simply pushes us a little bit further down the road of Global Missions involvement. Th-th-th-th-th… That’s all for this week folks. Let me leave you with the final volley of fireworks from last night.